Read our tutorials on reneawble energy (Solar and Wind). The more you know, the more likely you are to join the millions of people who are already generating their own clean, safe, free, electricity at home or business. Personal benefits include financial savings. Society benefits by reducing energy dependance on unreliable sources. The entire world benefits by reduced carbon emissions and pollution. The first (left-most) image below is a link to the beginning of our wide and deep tutorial on renewable ("green") energy. The main topic is solar (photovoltaic, or "PV") generation of electricity, with additional chapters on wind based power generation, as well as solar heating of water. The second image below is a link to help you find incentives (e.g. tax rebates or cash subsidies) available in each state in the U.S. Often the government assistance can really make it worthwhile to invest in your own renewable energy system. At the top of this page are also links to coupons or promo codes that will give you significant discounts at home improvement stores like Lowe's and Home Depot. If you decide to embark on the journey of building your own green power system, you'll find yourself at these stores, and RenovoPower wants to help you save money. We also have a forum for comments, discussions, or thanks for tips, savings ideas, etc. You will also find a donate button to help us continue our work. Tell your friends about us and share the good word. 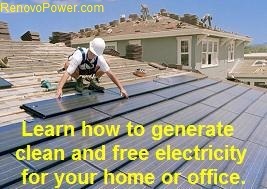 Begin the tutorial about generating free and clean solar electricity or hot water for your home or business. Learn about solar cash incentives, tax rebates/discounts specific to your state. Are you getting the speed you're paying for ?